Downers Grove, Ill. : IVP Academic, ©2011. The ubiquity of Mark. The puzzle of Mark ; When the John Mark of history meets the St. Mark of memory ; The Markan nucleus of African liturgy and catechesis. "We often regard the author of the Gospel of Mark as an obscure figure about whom we know little. Many would be surprised to learn how much fuller a picture of Mark exists within widespread African tradition, tradition that holds that Mark himself was from North Africa, that he founded the church in Alexandria, that he was an eyewitness to the Last Supper and Pentecost, that he was related not only to Barnabas but to Peter as well and accompanied him on many of his travels. In this provocative reassessment of early church tradition, Tom Oden begins with New Testament evidence and adds to it African sources, including synaxaries, archaeological sites and non-Western historical documents. The result is a fresh and illuminating portrait of Mark, one that is deeply rooted in African memory and seldom viewed appreciatively in the West"--Publisher description. 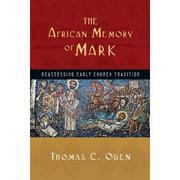 Add tags for "The African memory of Mark : reassessing early church tradition". Be the first. library:placeOfPublication <http://experiment.worldcat.org/entity/work/data/790264339#Place/downers_grove_ill> ; # Downers Grove, Ill.
<http://experiment.worldcat.org/entity/work/data/790264339#Place/downers_grove_ill> # Downers Grove, Ill.
schema:location <http://experiment.worldcat.org/entity/work/data/790264339#Place/downers_grove_ill> ; # Downers Grove, Ill.